SUCH is the divine matter and admirable order of the Lord’s Prayer, as became the eternal wisdom of God, that composed and dictated it to his disciples. In it are opened the fountains of all our regular petitions, and the arguments contained to encourage our hopes for obtaining them. In our addresses to men, our study is to conciliate their favourable audience; but God is most graciously inclined and ready to grant our requests, therefore we are directed to call upon him by the title of ‘Our Father in heaven,’ to assure us of his love and power, and thereby to excite our reverent attention, to raise our affections, to confirm our confidence in prayer. The supreme end of our desires is the glory of God, in conjunction with our own happiness: this is expressed in the two first petitions, that ‘his name may be hallowed,’ and ‘his kingdom come,’ that we may partake of its felicity. In order to this, our desires are directed for the means that are proper and effectual to accomplish it. And those are of two kinds — the good things that conduct us, and the removal of those evils that obstruct our happiness. The good things are either, the spiritual and principal means to prepare us for glory, an entire, cordial, and constant obedience to the divine commands, expressed in the third petition, ‘Thy will be done on earth, as it is in heaven;’ or, natural and subservient, the supports and comforts of this life, which are contained in the fourth petition, ‘Give us this day our daily bread.’ The removal of evils is disposed according to the order of the good things we are to seek: we pray that our sins may be forgiven, the guilt of which directly excludes from his glorious kingdom; that we may be preserved from temptations, that with draw us from observing the divine commands; and to be delivered from all afflicting evils, that hinder our arrival at our blessed end. The conclusion is to strengthen our faith, by ascribing to our heavenly Father, the kingdom, power, and glory, and to express our ardent desires of his blessing, by saying, Amen. 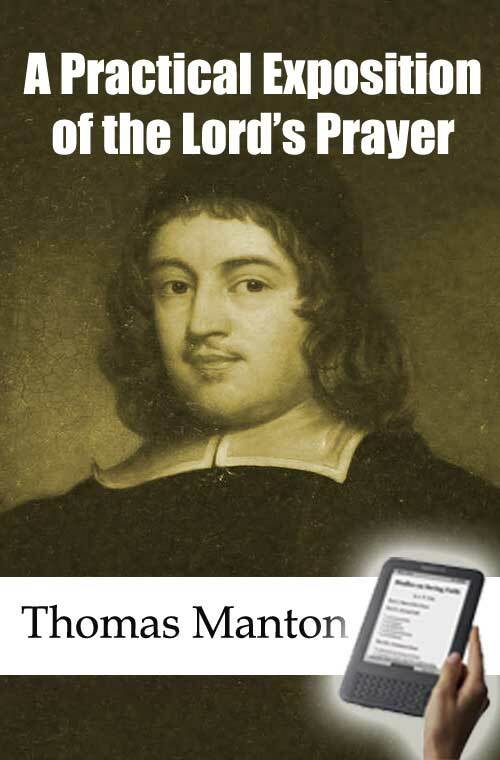 This divine comprehensive prayer is the subject of the following sermons, wherein the characters of Dr Manton’s spirit are so conspicuous, as sufficiently discover them to be his; and the reader is assured they have been diligently compared with his own copy.